Join Susan B. Anderson for a fun-filled talk entitled Stash Changing Moments, about all things knitting! Susan will share an excerpt reading from her chapter in the newly released Clara Parkes’ book called A Stash of One’s Own. Susan will discuss a bit about her background and how she got her start as a knitwear designer and author including the backstory on some of her most popular designs. She will cover some of the most commonly asked questions of her and offer some tips for getting started as a knitting designer. Susan will talk about her new American wool company and pattern line, Barrett Wool Co., what she’s learned, how it all came to be and what’s happening one year in. Lastly, she will love to take questions from the audience. 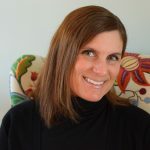 Susan B. Anderson of Madison, Wisconsin, is the author of several best-selling books, including Itty-Bitty Hats, Itty-Bitty Nursery, Itty-Bitty Toys series, Spud & Chloe at the Farm, Topsy-Turvy Inside-Out, and Kids’ Knitting Workshop. In addition to her self-published pattern line, her designs have appeared in Parents Magazine, Knit Simple, Interweave Knits, and Noro Magazine, as well as independent yarn and design companies including Quince & Co., Infinite Twist, and Little Skein in the Big Wool. Susan loves traveling domestically and internationally, teaching, and meeting knitters from all over the world. Visit her award-winning blog susanbanderson.blogspot.com. Susan will give four workshops on November 7 and November 8. Learn more. Doors open at 12:15 pm. Susan’s presentation begins at 12:30 pm. Afterwards, there will be a business meeting followed by Show and Share. Bring your finished knitted items to show to all. Download a Show and Share Form and complete it at home where you have all the information. FOOD RESTRICTION REMINDER: Please observe the rules of Temple Solel, a kosher facility. *No meat, which includes chicken, beef and pork.